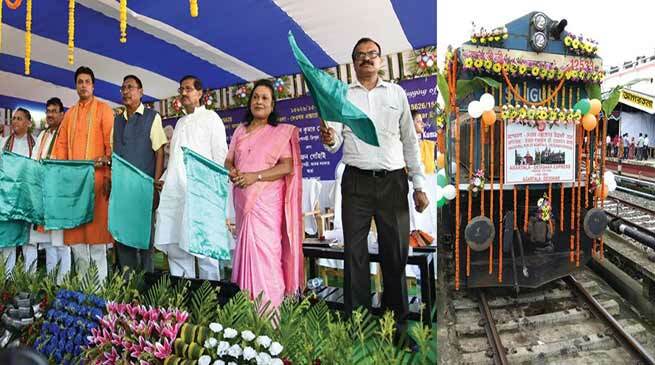 Chief Minister of Tripura Biplab Kumar Deb and Minister of State of Railways Rajen Gohain today flagged off the 15625 / 15626 Agartala – Deoghar Weekly Express train during a ceremonial function held at Agartala station. Minister of State of Railways Rajen Gohain in his speech said that this new train connecting the land of Tripura Sundari Temple with Baidyanath Dham fulfilling a long-standing demand of people of the region. It is the 12th train to be introduced in Tripura since December 2016. The capital city of Agartala has already been connected with New Delhi, Kolkata, and Bangalore. The train will cover the distance of 1,462 km between Agartala and Deoghar in about 39 hours. From Agartala, the train will leave every Saturday at 22.00 hrs to reach Deoghar at 13.00 hrs of Monday. In the return direction, the train will leave Deoghar every Monday at 18.45 hrs to reach Agartala at 08.15 hrs of Wednesday. It will traverse through the states of Tripura, Assam, West Bengal, Bihar and Jharkhand. The train will have 20 stoppages in its journey including Agartala, Ambasa, Dharmanagar, Badarpur, Lumding, Guwahati, Rangiya, New Jalpaiguri, Katihar, Khagaria and Bhagalpur. The new train introduced today has many advanced safety features including highly crashworthy Centre Buffer Coupler which will minimize injury to passengers in case of any accident. The AC 3-Tier fare from Agartala to Deoghar would be about Rs. 1,600/- per person and the fare in sleeper class would be Rs. 580. The new train will traverse through the states of Tripura, Assam, West Bengal, Bihar and Jharkhand providing connectivity to a large number of people of the entire eastern India.